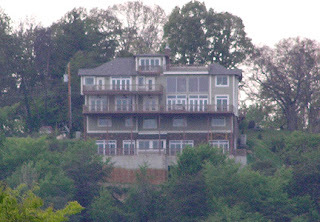 This is a picture of the backside of the dream house here in Chattanooga. If you have never heard about it, it was a show on HGTV that documented a young couple that took out a loan to build thier dream house. It's 6500 sqft and has five levels. They went through all kinds of crap to get this house built and now they're selling it! Crazy! HGTV never showed the final result but we were able to get a picture of it in case anyone wanted to see what it looks like. Not much of a backyard and it's a mighty steep drop from the top of that house. Pretty scary especially if you're affraid of heights. You can see for miles and miles from up there. Anyway, here's the website that has more information about the Chattanooga Dream House.